Casein, like whey, is a complete protein source that is derived from dairy. It’s known as a slower-digesting protein, which is why you’ll see it suggested before bed, or as part of a meal replacement shake. Casein is generally a better muscle builder, a better strength builder, and a better fat burner than whey. It should also be noted that not all casein is equivalent. 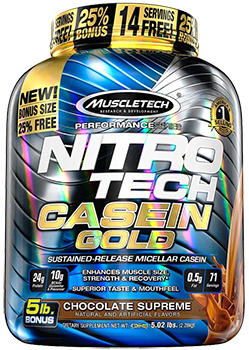 Micellar casein, as opposed to caseinate, is isolated from milk by filtration rather than by use of acid or heat. This filtration method preserves the structural integrity of the protein. When heat or acid is used to separate casein out of milk, the micelle’s structures are altered, resulting in a loss of biological activity and digestibility. It’s not surprising then that undamaged milk proteins, such as micellar casein, provide more than just a source of amino acids. It also provides many biologically active proteins that have direct immune and physiological benefits. Antibacterial and immune benefits: Some cell studies suggest it may provide antibacterial and immune benefits and reduce high blood pressure. Triglyceride levels: One study in 10 overweight individuals found that it reduced triglyceride levels after a meal by 22%. Reduction in free radicals: Some of the peptides in casein protein powder may have antioxidant effects and fight the buildup of harmful free radicals. Fat loss: One 12-week training study found the average fat loss among people taking the supplement was three times greater than in a placebo group. Helps promote colon health: In a study performed out of Australia, researchers investigated the health benefits of various proteins and found that dairy proteins promote colon health better than meat and soy. This proves to be yet another reason why you should strongly consider adding casein protein to your daily intake. A good number of studies have confirmed that casein leads to superior gains of lean mass and strength. One study using weight-trained subjects showed a doubling of lean mass gains and 50% greater fat loss over that of the whey group. The casein group also increased bench, shoulder press, and leg extension strength by a collective 59% whereas the whey group only had a 28% increase in strength. Another study, this one with burn patients, showed that 70-75 grams of casein outperformed the same amount of whey. The casein group gained lean muscle twice as fast as the whey group, despite having to deal with the incredibly high metabolism and increased protein oxidation from injuries. Every night when you sleep, you risk catabolism, where your body will break down the muscles to use as energy for the metabolic activities (like breathing, digestion, and a beating heart). By incorporating casein protein supplement you can not only curb your hunger in a healthy way but also promote robust stimulation of muscle protein synthesis. Try taking casein protein powder before bedtime. You won't be disappointed if you try it!